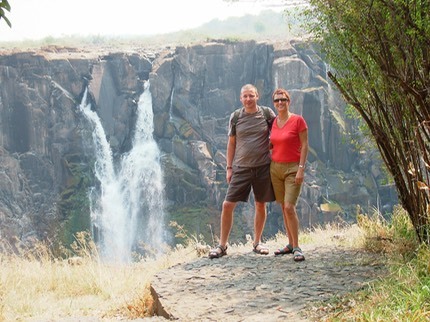 We started our safari in Livingston Zambia visiting Victoria Falls for a couple of days. Victoria Falls was not in full flood but still very impressive. 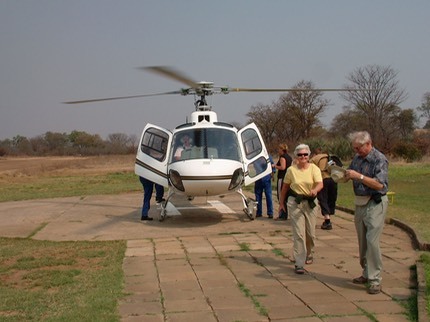 A helicopter ride saw us over the falls, then down the gorge at low level before flying back over a National Park and seeing Rhinos, Elephants and Buffalo out of the window. We stayed in Tongabezi Lodge with a view of the Zambezi and a pod of Hippos. The helicopter we flew in for a flight over the falls and then down the river. Unlike most flights in other countries these helicopters flew within the canyon walls. It was like being in a war sneaking up on the enemy for a surprise attack. 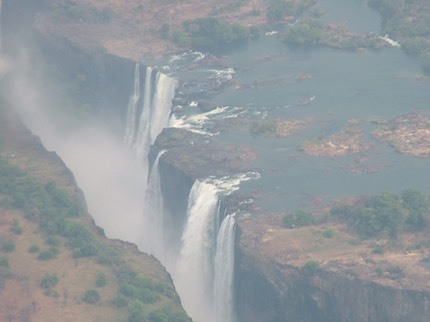 This picture of Victoria Falls from above was taken from the helicopter and clearly shows the might of the falls and the huge volume of water that enters the canyon, raising water vapour up, we above ground level.